Gesu Parish and School is a diverse, long-standing, and highly respected ministry in the city of Detroit. For almost 100 years the Sisters of the Immaculate Heart of Mary and the Priests and Brothers of the Society of Jesus (Jesuits) have served the neighborhood and city with care and devotion. Gesu joins the University of Detroit Mercy, which is located across the street from Gesu School, in serving the needs of young and old alike. Gesu has been a contributor to the renewal of Detroit. The primary role of the Pastoral Associate is to share the overall care of the parish with the pastor. He or she is a member of the parish pastoral team in promoting the Mission and Vision of Gesu. The ministry of the pastoral associate is comprehensive, relating to all aspects of parish life, but with designated responsibilities in various areas of specialized need, including but not limited to evangelization, liturgy, adult faith formation and development, administration, RCIA, pastoral care, and social outreach. The responsibilities assigned to the pastoral associate fluctuate depending on the goals and needs of a specific time within the parish. Part-time bookkeeper position available for St. Anthony and St. Thomas Catholic Churches, Monday through Friday, 10 am – 3 pm. The self-motivated, self-directed applicant should have previous training and/or 3-5 years experience in bookkeeping, computer and organizational skills, and possess the ability to work independently. Duties include accounts receivable and accounts payable, payroll, account ledgers and financial statements. Applications are available at the parish office located at St. Thomas the Apostle Catholic Church, 1820 9th Ave. North, Escanaba, Monday – Thursday, 9 am-3:30 pm. Deadline for applications is March 21, 2019. St. Michael Parish is looking for someone with a great love of the Lord and joy in sharing this love with her/his parish family; someone with experience, enthusiasm and a collaborative leadership style to create dynamic faith formation programing for our whole parish family. Our goal is to build the best Faith Formation program possible through effective use of the talents of our staff and volunteers and wise use of the parish's limited financial resources. St. Albert the Great Parish, Houghton & St. Anne Parish, Chassell, seek a highly-motivated, innovative full-time Office Manager to join their team in Houghton and Chassell! The ideal candidate has a desire to serve Jesus Christ. The Parish Office Manager is an administrator in support of the pastor’s responsibilities to the parish & vocations duties. COMPENSATION: $12-$18 per hour, depending on experience as well as an excellent compensation package including health insurance and pension. Please no walk-ins or phone calls! St. Albert the Great Parish: St. Albert the Great University Parish was founded by Fr. William McGee and built in 1963. It is a "personal parish" that serves the students, faculty, and staff (both current and retired) of Michigan Technological University, as opposed to a "territorial parish" which would serve a given geographical area. Holy Name Catholic School in Escanaba is seeking a long-term, full-time substitute middle school religion teacher and Faith Formation Coordinator. The position will begin in late February and run through the end of the school year. The opportunity to apply for this position for the 2020-2021 school year as a full-time position would require a Bachelor’s degree in Catholic Studies or an equivalent degree. The person must be a faithful, practicing Catholic, preferably with teaching experience and theology training. Any qualifying person who would like to be considered for this important position can submit a letter of interest describing their personal relationship with Jesus and His Church, along with a resume to Joseph L. Carlson, Holy Name Catholic School, 409 South 22nd Street, Escanaba MI or email to jcarlson@holynamecrusaders.com. Applications are being accepted through February 1, 2019. Summer Missionary Internship is a three-month formative community for college-age students and graduates who are tired of the same-old secular culture. Summer Missionary Internship begins on June 8th and ends on August 18th. You will join other college students to live in Catholic Christian community for three months in the beautiful Upper Peninsula of Michigan. You’ll have a daily schedule of prayer and apostolic mission work doing it all for God. All the while you can enjoy beautiful hiking, swimming, and biking through state forests and along majestic Lake Superior. You will be asked to give of yourself in a radical commitment to Christ and His Church. 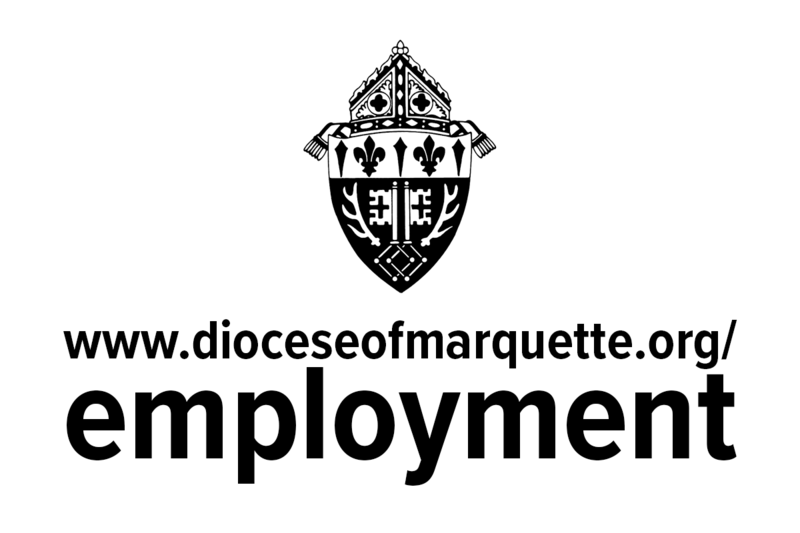 A link to the job application for the Diocese of Marquette is below. We leave this available online for your convenience, even when no diocesan jobs are posted.